When the Sons of Liberty dump English tea into Boston Harbor, 12-year-old Daniel Prescott cheers. But he's less thrilled when King George sends soldiers to take over the city. While his father joins the rebels, Daniel spies on British officers at the family tavern. Will his courage fail him when he needs it most? 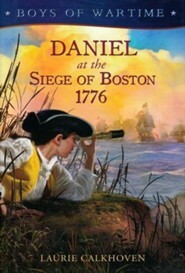 Twelve-year-old Daniel cheered when American colonists dumped English tea into Boston Harbor to protest taxes. But King George sends soldiers to punish the rebellious colonists, and friends turn on one another to protect themselves. Daniel works in the family tavern and spies on Redcoat officers after his father leaves to fight with the Patriots. He soon learns how to slip vital information across British lines to his father and General Washington. He must face his fear and put his life in danger. But, to a Patriot, liberty is well worth any risk. Laurie Calkhoven lives in New York City. 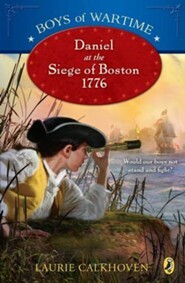 I'm the author/artist and I want to review Boys of Wartime: Daniel at the Siege of Boston, 1776.